The Young Textile and Fibre Group (YTFG) was a completely new concept for the Embroiderers' Guild when it started in 1995. With little formal needlecraft taught in schools today and families often busy or scattered, many children do not have any exposure to needle or fibre arts. In 2014 the Guild voted in the affirmative for some Constitutional changes which included allowing the Group to choose its own name. From 1st January 2015 the Groups will be called JUNIOR STITCHERS. In Junior Stitchers the emphasis is on creativity and fun rather than on the formal learning of techniques! The Guild, with a wide network of experienced embroiderers and many members who are interested in supporting and actively encouraging the young, is in an ideal position to set up Clubs in NSW and to provide practical backup. The original YTFG started on 1 March 1995, membership is open to all aged between 5 to 16 years, each of whom will be an individual member of the Group. They may or may not be part of a Club, depending on where they live. the right to visit Headquarters, have access to the Library facilities whilst visiting (but not borrow books) and can buy embroidery supplies in The Threaded Needle. There are clubs in the Greater Sydney Metropolitan area, regional and country areas. There are over 250 members around New South Wales and interstate. Each club is guided by a Club Leader who is assisted by, and responsible to, the Junior Stitchers Committee. Clubs meet monthly, or only in the school holidays, to suit individual circumstances. Each Club has a Leader, assisted by helpers drawn from Guild members. All Leaders hold current "Working with Children" certification. Meetings normally take the form of an informal workshop with children working on a different theme at each day and producing something to take home at the end of the day. There is a small ongoing programme of classes and workshops at Headquarters each year for Group members for which there will be a class fee. 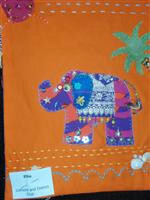 Why not read our Junior Stitchers Blog for more information?